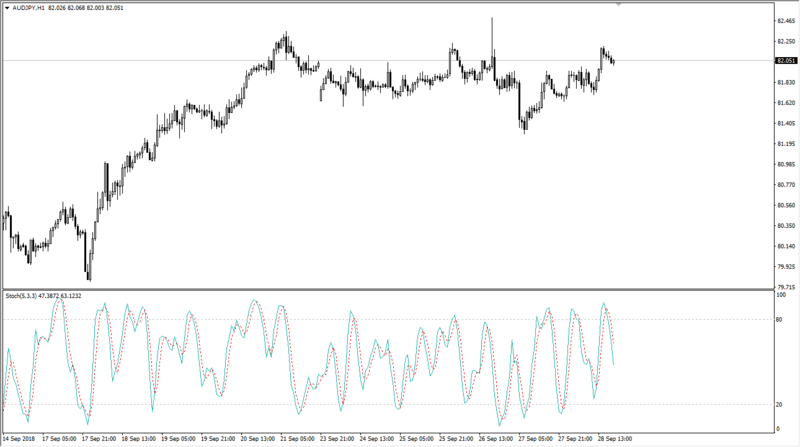 One of the most common indicators used by Forex traders is the stochastic oscillator. 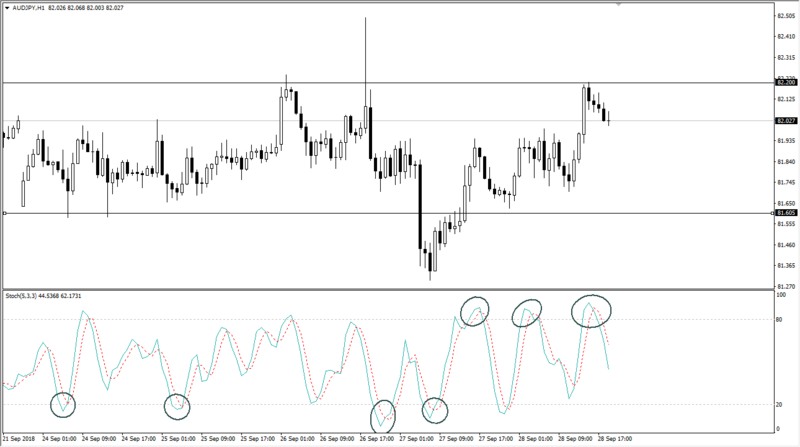 It’s a momentum indicator, as it compares the closing price of the currency pair to the range of its prices overall during a certain period of time. There are some basic set ups that are the default settings, but you can adjust the sensitivity of the oscillator to see shifts and momentum much more quickly. However, I would stress that stochastic oscillators are typically used in congruence with a larger trading strategy. They are very rarely used alone. As you can see, occasionally the indicator will crisscross the lines above the 80, which of course is the overbought condition, or below the 20, which is the oversold condition. This is how most people will use stochastic oscillators, as a sign that perhaps it’s time to buy and sell based upon a resumption of what we seen over the last several candles. However, in a trend this reliability tends to disappear. 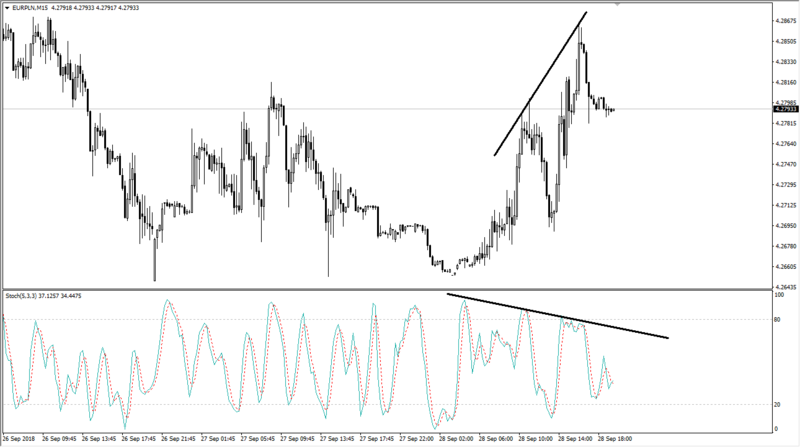 It is because of this that you will often see stochastics offer more reliability when you include support and resistance. Below, you can see the same chart zoomed in, with support and resistance levels drawn as well as stochastic signals circled. On the chart, there are several areas where the lines cross in either the overbought or oversold condition, and when married with the idea of support and resistance, this can be a powerful signal. However, I would also point out that sometimes it will crisscross between major support and resistance lines, so therefore it becomes a little less reliable. It’s extraordinarily rare to find somebody who trades a system that uses only the stochastic oscillator. Because of this, I believe that it’s best described as a “secondary indicator.” I often use it to confirm my analysis such as the overall momentum of the trend. The stochastic oscillator has been around so long that it has become a basic part of many algorithmic trading systems as well. Keep that in mind because some automatic trading may be fired off in the market every time we get a cross. Like all things technical analysis related, it’s typically more effective on the longer-term charts than the short-term charts. This is probably because it takes so much in the way of price action and trading volume to move the market over the longer-term charts such as the weekly timeframe. When you look at a five minute chart, it’s basically noise. It might be with the overall trend, but it’s not what is actually driving the market or changing the attitude of traders who employ large amounts of capital into the Forex markets. That being said, it does help you with other signals such as a trend line, perhaps a moving average, or even algorithms.